Over time I realized that when I travel one of the most important things to me is the atmosphere of the place. A restaurant can offer delicious dishes but if the waiters are not smiling and I don’t feel at ease I can’t say that I lived a great experience. On the contrary I noticed sometimes that, even if I find some flaws in a place, I sense to experience something to remember thanks to the treatment received and the friendliness of the people. Such is the power of kindness. I must say that during one of visits in Montagnana I observed this very important aspect at the Hostaria di San Benedetto, a beautiful restaurant located in the centre of the medieval village in a building of the XVIII century. When my husband and I arrived it was raining. Unfortunately we could not therefore eat in the courtyard outside which is really nice. 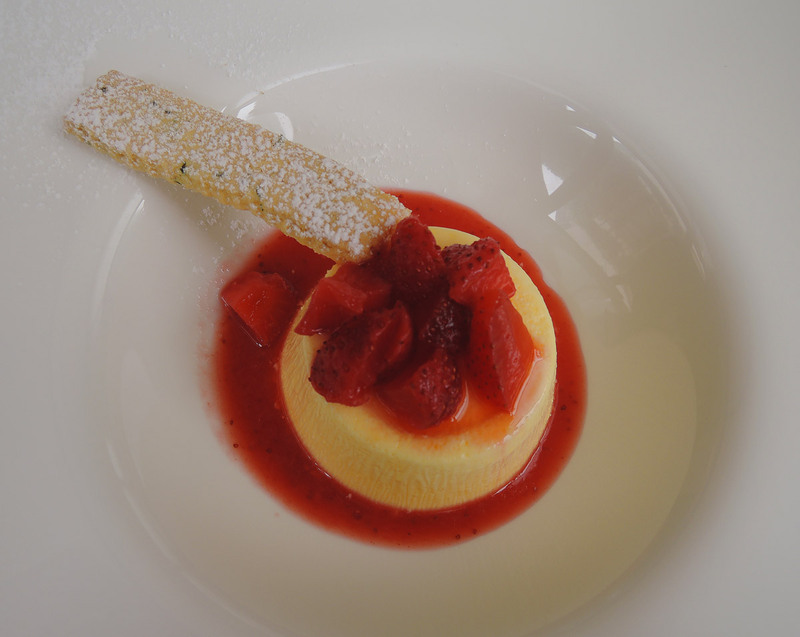 I must say it was just as good to eat in the veranda, which allowed us to have a view towards the outside. The interior of the restaurant was quite nice, better than it looks in pictures. The waiter immediately greeted us warmly (and to think that I was worried because we were dressed in a very casual way!). Therefore we immediately felt at ease. After a look at the menu we decided to try the traditional tasting menu at the cost of €29 (minimum 2 people serve). It consisted of half portions. As starters: prosciutto crudo and gallina padovana salad (Padovana chicken) with raisins, nuts and pine nuts. Both delicious. 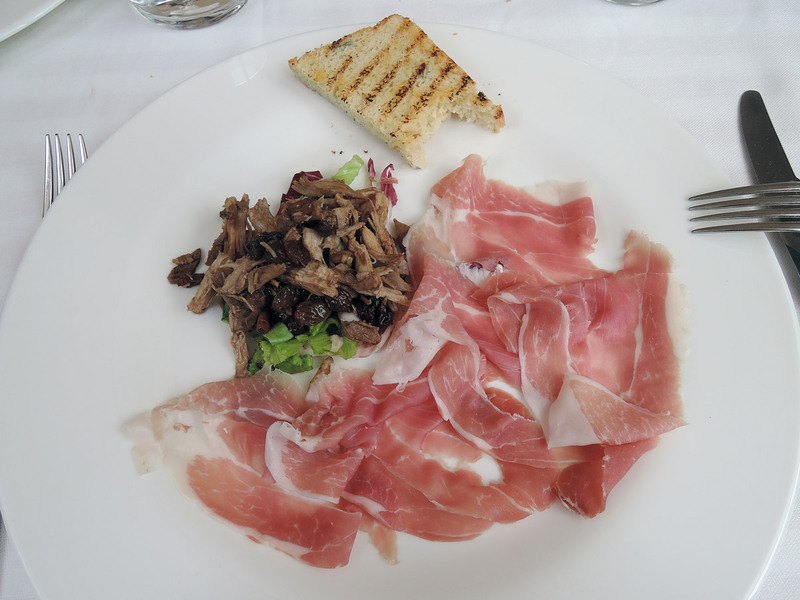 The prosciutto was sweet and so soft that it melts in your mouth. The chicken salad had a pleasant sweet and sour taste. It was cold. I don’t know if that it was supposed to be so or not. Te two “first courses” arrived separately. Pappardelle with goose sauce. The cooking point of the pasta and the pasta itself were excellent. But I found 2 flaws: the amount of sauce wasn’t enough and plus it was too lightly salted. It was a shame because the flavour of the meat was great. It just needed more zing. 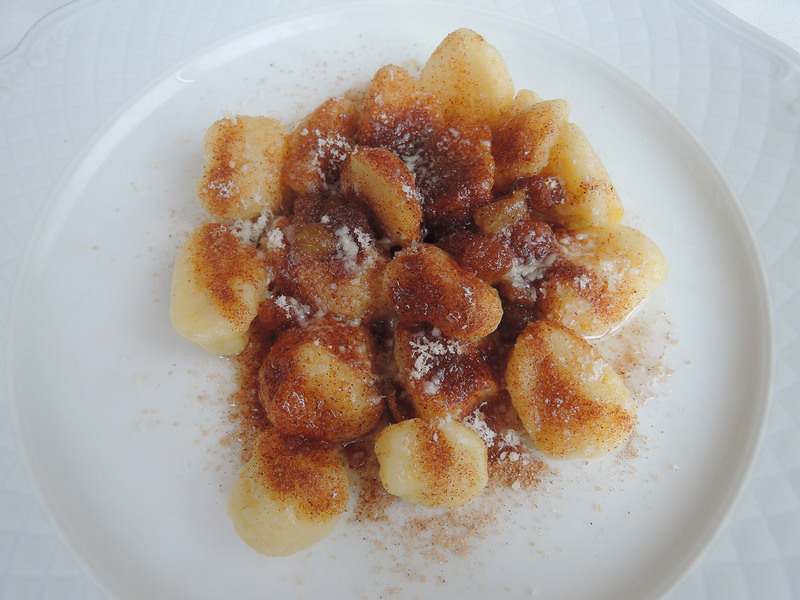 Venetian sweet dumplings (gnocchi) with raisins and cinnamon, sugar and butter. That was the first time I ate them and I found them very strange. I like them but in the menu it was not specified the presence of cheese. That way the dumplings were not entirely salty nor entirely sweet. I would have preferred them without cheese, served as a sweet for dessert. But that’s just my opinion. Anyway, they are peculiar, not suitable for all palates. Don’t say I didn’t warn you! 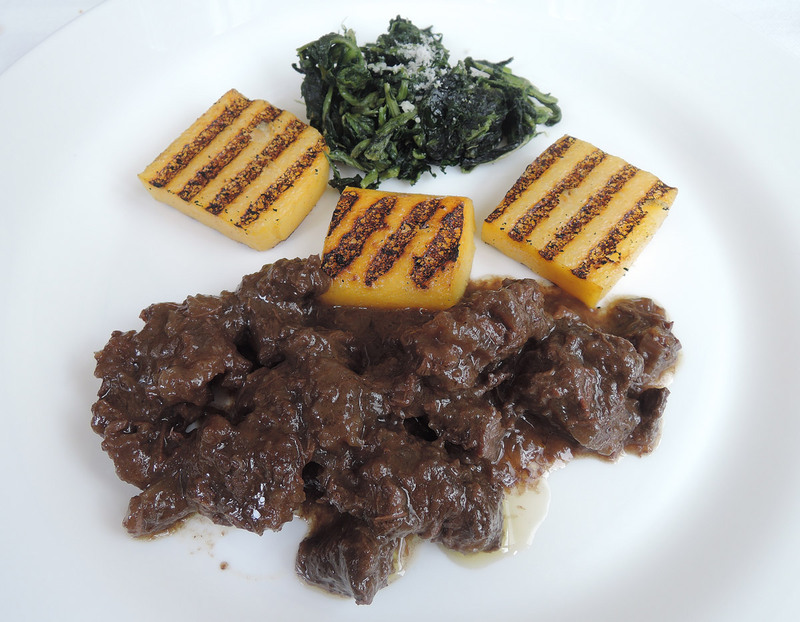 Then they served us donkey stew (stracotto d’asino) in cabernet wine of the Euganean Hills with polenta. It was great, delicious, soft, and the flavour of the wine was not dominating. It was the best dish we ate here. As for the dessert, we had the chance to choose it out of the list. 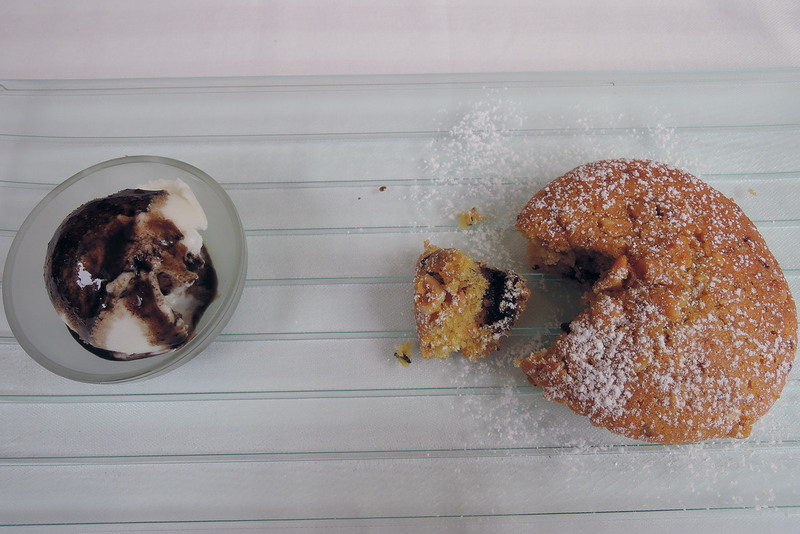 My husband had a Linz style mini cake accompanied with mint ice cream. Very good. With a coffee, a bottle of water and a glass of red wine we paid €65. In conclusion we felt so at ease to forget the little flaws we noticed. 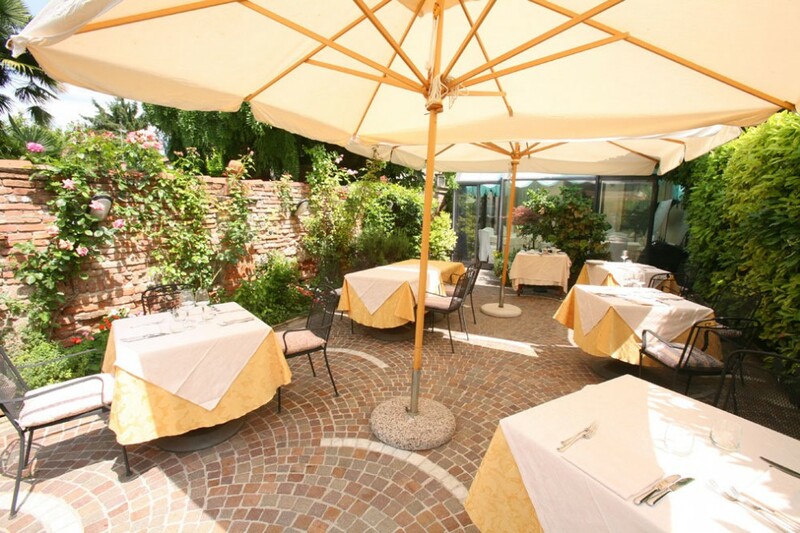 Plus, it must be very romantic to eat here with a sunny day, the courtyard seemed so nice! 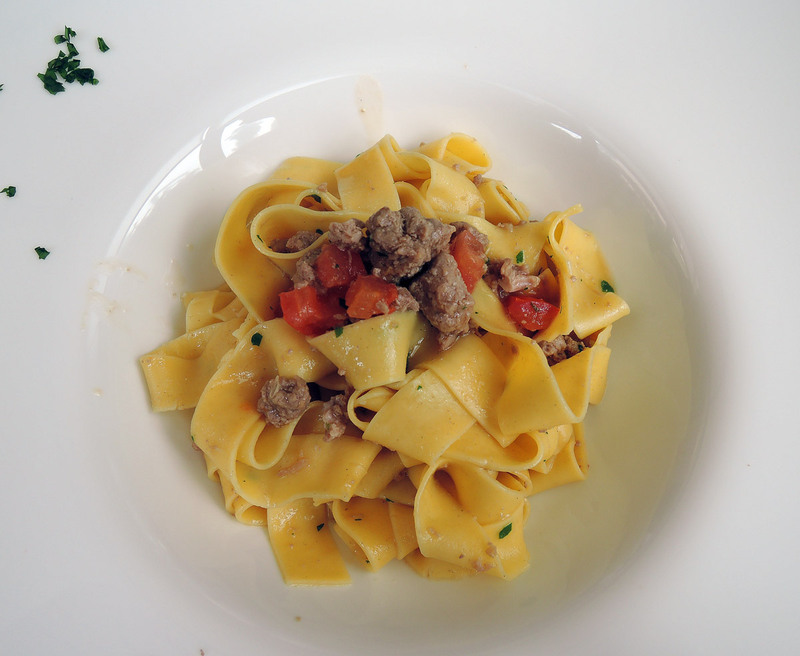 We enjoyed very much our lunch at Hostaria San Benedetto, the atmosphere was relaxed and pleasant. Last but not less important, the digestion went well. I would definitely go back to try other specialities (such as the baked Duck Leg with Moscata grape).